Standard Chartered's outward telegraphic transfer form is used for paper-based remittances, enabling your transaction to be processed in a timely manner. Branch: Your domicile branch or the branch where you opened the account. Resident (Yes/No): Is the applicant a local resident? In some countries, this information is required. 32A: Value Date: Date on which this transfer needs to be executed. It may not be the same as the date of submission. 56A: Intermediary Bank (Name, Address, Country): This is an optional field. However if the payer has a specific preference as to which bank the transaction should be routed through, this field may be completed. Bank Code: This is a unique identification code for an intermediary bank. Payers are expected to insert a single code only, which can either be a SWIFT BIC Code or a local clearing code, e.g. Routing Number Code (Fedwire/ABA) or CHIPS UID Code for USD; UK Domestic Sort Code for GBP; Australian Bank State Branch (BSB) Code for AUD. Similarly, we recommend you obtain the applicable bank code for other currencies/countries from the payment recipient or intermediary bank. 57: Beneficiary's Bank (Name*, Address*, Country*): The bank at which the beneficiary holds the account or the bank to which the funds are being transferred, usually by way of international wire transfers. Bank Code: This is a unique identification code for a beneficiary bank. Payers are expected to insert a single code only, which can either be a SWIFT BIC Code or a local clearing code, e.g. Routing Number Code (Fedwire/ABA) or CHIPS UID Code for USD; UK Domestic Sort Code for GBP; Australian Bank State Branch (BSB) Code for AUD. Similarly, we recommend you obtain the applicable bank code for other currencies/countries from the payment recipient. 59: Beneficiary (Name*, Address, Country*): The receiver of the funds. Resident (Yes/No): Residency status as per the country stated by the beneficiary. Account No. */IBAN: IBAN stands for the International Bank Account Number and is used by banks in most European countries for cross-border funds transfers. Every client has their own unique IBAN and this should be quoted for all cross-border funds transfers to European countries. The list of European countries for which this is may be required and the IBAN format for each country can be found in the Appendix to this document. ID/Passport No. : Identification number of the beneficiary. ^ Either one of these fields must be completed. Payment Method (From Account/Others): The method in which the remittance request is funded. Debit A/C No. (Currency/Account)*: This is to be entered if the remittance is funded from an account with Standard Chartered. Charges Debit A/C No. (Currency/Account)*: The account number that charges for the remittance are to be debited from. Remittance of (Currency/Amount)^: Currency and amount to be transferred, spelt out in words. Equivalent of (Currency/Amount)^: Enter the "Remittance of - Ccy" and state the "Equivalent of - Ccy" & "Equivalent - Amt", spelt out in words. In this case you may leave the "Remittance of - Amt" blank as this will be calculated by the bank which is dependent on the exchange rate at the time of processing. 70: Details of Payment: Some payments will have an important message that needs to be captured in the payment, e.g. invoice no., breakdown of the funds. 71: All local and overseas charges borne by beneficiary (BEN), remitter (OUR) or (SHA)*: Who bears the charges? If all local and overseas charges are borne by beneficiary, then it is "BEN". If all local and overseas charges are borne by remitter, then it is "OUR". If charges are being shared (SHA), the applicant will bear local charges and the beneficiary will bear the overseas charges. 72: Bank to Bank Information: The remitter bank can provide some information for the receiving bank to take note, e.g. when paying USD equivalent of SGD, the remitter bank can give instruction to the receiving bank either to convert or not convert to SGD when the funds are received. 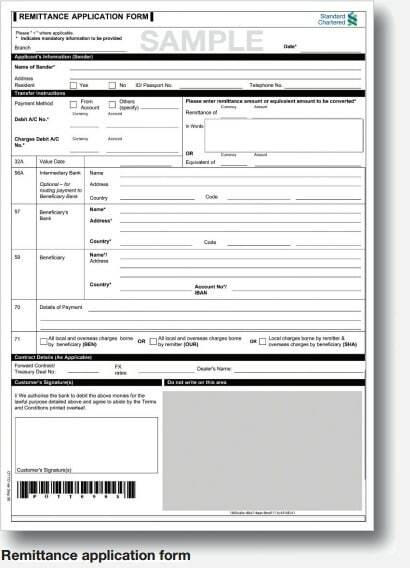 Can also be used if the applicant needs to indicate the address of the beneficiary bank/account/address of beneficiary bank. Forward Contract/Treasury Deal No., FX rates, Dealer's Name: Before sending your remittance instruction some customers might have contracted a FX rate with dealers. Hence kindly input the contract or deal number and the dealer's name. Customer's Signature*: Client to sign in this box. This signature should be similar to the signing mandate of the debiting account. A copy of the SWIFT (MT103) is required. The charges are to be debited to account no. : Check this box if a copy of the remittance message is required. In most cases, the remittance debit advice will be sufficient.